On lazy summer days I like to go out in my tiny garden, flop down on a chair and watch pollinators at work on my flowers. Bees are the workaholics of the insect world. They buzz along from flower to flower. The bumblebee is the lovable bear of the bees. The striped fur coat is tailormade for attracting pollen, and the plump pollinator is built like a truck to carry a lot of cargo. Some flowers are especially suited for pollination by bumblebees. The bumblebees are wild about the Thymus x citriodorus ‘Unni’ in my garden. 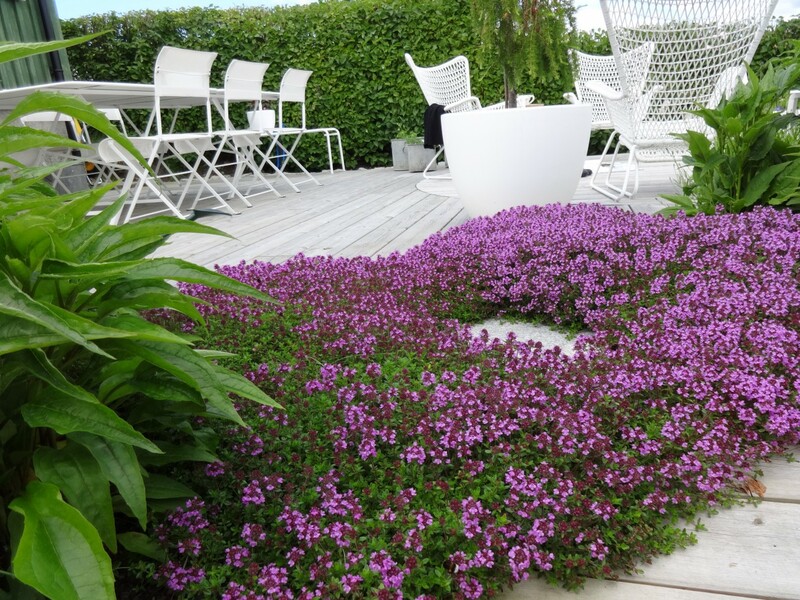 When the thyme blooms, this part of the patio is abuzz with bees. Bees are in trouble. We all can help improve the lot of bees by planting the flowers they love, whether we garden on an acre or in a window box. One small bumblebee garden may not seem like much, but as these patches of backyard habitat multiply across the community and the country, they can play a vital role in feeding and protecting threatened pollinators. Let’s do it, people!